Philadelphia-born drummer and singer Donald Gardner met Harry "Doc" Bagby in the late 1940s, taking advantage of an opportunity to put his sticks to the test with Harry Crafton's band (which counted organist Bagby among its membership). In 1949, when Donald was 18, his first of two 78s for the Gotham label, the Kurt Weill-Maxwell Anderson classic "September Song," was released. It fueled the fires for a career that took him through the better part of three decades, peaking in 1962 with a walloping soul duet he couldn't possibly have foreseen when he started out as a jazz musician. Besides Bagby, Gardner formed a far-reaching association with Jimmy Smith; the pianist from nearby Norristown played with Crafton's group and signed on as organist when Don and Doc broke away a few years later to form The Don Gardner Trio, which evolved into The Sonotones, recording vocal and instrumental tracks for Bruce Records of New York in 1954 and '55. Smith left around '56, going on to set a high bar for the jazz organists that followed, notching a string of hit singles and albums for the Blue Note and Verve labels well into the '60s. Richard "Groove" Holmes was, for a time, his replacement in the Gardner trio. Don didn't let Jimmy's departure slow the momentum of his quest to make it big. He recorded for Cameo Records ("Only Love Brings Happiness") shortly after the Philly label's inception in late 1956 and within a year also had singles released on Junior ("High School Baby," "Dark Alley") and DeLuxe ("This Nearly Was Mine"), his vocal style taking on a little more of a rhythm and blues edge with each new record. Holmes headed out in search of his own solo grandeur in 1960 and was replaced by a 24-year-old female organist from Minden, Louisiana with expertise derived from years of playing in front of her church congregation. Wrecia Holloway had been living in Newark, New Jersey for several years and impressed Gardner with her versatility as both a keyboardist and gospel-oriented singer. Using the stage name Dee Dee Ford, she electrified clubgoers whenever she launched into a never-less-than-super-soulful vocal. Doc Bagby, still tight with Don, produced "Glory of Love," a spirited remake of the Billy Hill ballad (a major hit for Benny Goodman's band with vocalist Helen Ward in 1936 as well as The Five Keys in 1951); released on the Val-ue label in late 1960, it was the first tasty morsel served on a slab of vinyl to result from the impressive musical match of Don Gardner and Dee Dee Ford. During a performance one night at Smalls Paradise in New York (Smith had already recorded a live album at the legendary venue shortly after starting his own band), Fire/Fury Records owner Bobby Robinson dropped in and caught Gardner's set. The standout number was "I Need Your Loving," a midtempo rhythm tune with simple, straightforward lyrics, sung by Don with soulful backup by Dee Dee; as an encore, they did an extended version of the song, gaining momentum right up to the part where Don's feverish wail - 'Wo-wo-wo-wo...wo...WO!' - incited the crowd to shakin', twistin' fits of frenzy. Robinson signed them on the spot. The studio recording was arranged just like the club version; running nearly six minutes, it climaxed in the second half with an explosion of brass, organ, drums, Don's vociferous shout and Dee Dee's soul-drenched 'I need your lovin' every day!' It was this final two minutes and 53 seconds that Robinson sent out on 45s in the spring of 1962. Not surprisingly, it was a top ten R&B smash and top 20 pop hit. Doc Bagby got busy and succeeded in having "Glory of Love" rereleased by KC Records in August; it made a minor splash on the charts. 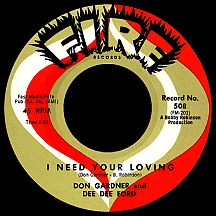 The Fire follow-up, "Don't You Worry" (cowritten by Robinson and Gardner), was similar to the big hit but with a slower tempo; it landed the duo back in the R&B top ten within a few weeks. 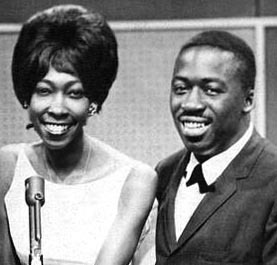 Don and Dee Dee left the label after only three singles and one album; Gardner has alluded to an issue over royalty money that never materialized. He moved to Jubilee and then G-Clef Records as a solo act and joined Ford for one-off 45s on the Red Top, Ludix and M.O.C. labels. A tour of Europe in 1964 revealed unusually passionate fan reaction during a stop in Sweden; they stayed awhile and even recorded for a Swedish label, Sonet. On returning to the U.S. in 1965, the pair went their separate ways. Dee Dee Ford wrote songs as Wrecia Holloway, scoring with "Let Me Down Easy," a '65 hit by Betty Lavette that is considered a soul classic. Having left the life of a jazz drummer far behind him, Don Gardner made some two dozen or more singles over the next decade for an assortment of oddball labels including TNT, Tru-Glo-Town, Sack, Mr. G, Cedrick and at least one major company, Verve Records (Jimmy Smith's label)! In 1973, Don teamed with Baby Washington (who'd racked up a dozen R&B hits from 1959 to '69) for some pre-disco interplay on the Master Five label; they had a nice run on the R&B charts that spring with "Forever."